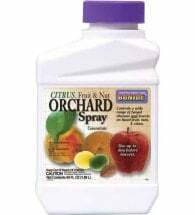 The safe, organic way to stop these killers of stone fruit trees without harmful chemical treatments. Heavy infestations, recognizable from the circle of oozing frass (the larvae’s excreted waste) around the trunk, can completely girdle trees, killing them if left untreated. Young trees are especially vulnerable. Older trees that survive attacks will show less vigor and inferior fruit quality. Borers are historically found across the United States and in parts of Canada, almost anywhere stone fruits grow. They existed on wild cherry and plum trees before non-native apricots, nectarines and peaches were introduced. Today, they’re a common and persistent threat to both commercial and home orchardists. The larvae of peachtree borers are white to beige and brown and obtain an length of an inch or more. The chewing end of the larvae darkens as it matures. Despite they’re size, they’re seldom seen as they bore beneath a tree’s bark, gouging out wide, fass-filled tunnels. Pupae, wrapped in silky cocoons, are also unseen hidden inside the tree. Adult moths have translucent wings and resemble wasps. Females are metallic blue and marked with an orange band on their abdomen. Males are smaller and are marked with yellow stripes. Their emergence a week or two into the summer sets off a frenzy of mating and egg laying. The lesser peachtree borer (Synanthedon pictipes) is found in the eastern United States, across the southern states to Texas and the midwestern states to Minnesota. It attacks more of the tree, including primary limbs, and is more likely than Synanthedon exitiosa to produce eggs throughout the season. Larva are similar in appearance to exitiosa, but male moths have narrower, more numerous yellow bands across their abdomens. The pest’s life cycle and treatment is similar to those of exitiosa. Adults begin emerging in late spring and early summer from larvae that have overwintered inside the tree an inch or two beneath the soil line. They continue to emerge throughout the summer and into the fall. Knowing when moths first emerge in your region, as early as April in Georgia and other warmer areas but more commonly in May and June, is critical to controlling the pest. The moths begin breeding almost as soon as they emerge. Females lay as many as 400 eggs on the trunk of the tree near the soil line or in the soil against the tree. The eggs take ten days to hatch. Larvae immediately seek entrance into the tree’s bark, often through cracks, chips and other damage. They tunnel through the bark into the vulnerable cambium layer beneath it and beyond, growing as they do. Some may pass through to adult stage in a single season. As cold weather sets in, larvae will reduce activity and overwinter inside the tree. They begin feeding again when temperatures warm. In spring, the larvae migrate from their holes, pupating near the entrance to their burrow or in nearby soil, creating a gummy cocoon of silk thread and bits of wood. The cocooning and pupation stages before moths emerge takes as much as four weeks. Moths begin laying eggs within minutes of taking to the air. Utah State University Extension Cooperative (PDF) has wonderful color photographs of the pest’s various stages. Peach tree borers bring major harm to important fruit-crop trees, destroying the tree’s vascular system through boring and girdling while inducing plant pathogens to invade the weakened tree. Borer damage inhibits the conduction of water and nutrients up the trunk to the tree’s branches, leaves and fruits. One or two borers will harm its growth and fruiting. Several burrowing into the same tree, fouling their tunnels with their waste, can kill a newly infested tree in a single season. Infestation are most common in older trees that have seen damage from canker, harsh winters, pruning and mechanical injury (like trunks being hit by mowers). This give the larvae an easy way into the tree’s insides. The lesser peachtree borer is particularly attracted to older, damaged trees. Numerous larvae cluster at these places in “galleries” where substantial damage may be done. The Missouri Botanical Garden has photos of damage signs as well as the larvae at work. Don’t allow borers to get established. Most trees will survive attack from small numbers. But large numbers of larvae can completely girdle a tree, killing it. Once the larvae move into the bark, they are difficult to manage. They’re most vulnerable at the surface before they chew their way into the tree’s bark and cambium layer. Wild trees provide a year-to-year home for borers. If you have wild plum, cherry or other stone fruits in your woodlot, consider clearing them. Female adults are attracted to diseased, damaged and otherwise stressed trees. Removing and replacing older, stressed trees that harbor borers can help make control issues easier to deposit their eggs. Healthy, adequately watered trees are less likely to invite infestation. Take care to keep your trees strong and undamaged. Borer treatment begins early in spring even before larvae become active. Probe small holes in trunks near the soil line, especially those with evidence of frass, with the point of a knife or stiff wire to crush larvae (and later pupae) beneath the bark. In severe infestations, scoop soil out from around the crown of the tree where frass collects and use a sharp-pointed object to dig out the larvae, taking care not to harm the tree. Be on watch and prepared for the emergence of adult moths. Because they begin breeding and laying eggs within hours of emerging, it’s important to treat for them as soon as they appear. Ask local nurserymen when the first moths are expected in your area. Monitor trees for moth activity daily and keep journal records for future years. 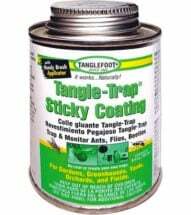 Use pheromone traps or Tangle-Trap® Insect Trap Coating to capture adults. Inspect traps daily. 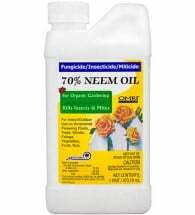 Begin spraying organic neem oil in the highest recommended concentrations around the crown of the tree and up the first six to 12 inches of the trunk when adults are anticipated. Saturate both bark and soil. The oil will disrupt the moths’ breeding cycle and discourage them from leaving eggs. 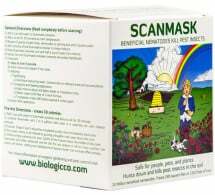 It will also neutralize eggs that may already have been laid as well as penetrate the bark and inhibit development of larvae already in the tree. Spray twice a month throughout the breeding season which can last until September. Reapply after rains. 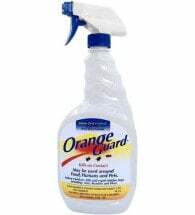 Citrus extract sprays will repel adults and discourage egg laying. Begin spraying trunks and around the crown of the tree just ahead of moth hatch. Paint tree trunks and exposed roots with a paste of Surround WP, a powder made of kaolin clay. Coat base of tree, exposed roots and trunk up to 12 inches. Once dry, the coating deters adults and their egg laying. 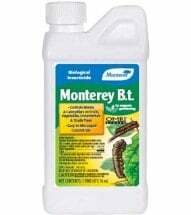 Applications of Bt (Bacillus thuringiensis), a naturally occurring soil bacteria, will disrupt larvae and kill them depending on exposure. 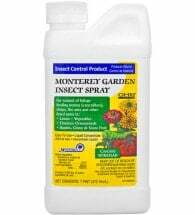 Spray Bt directly into borer holes after clearing out as much frass as possible. 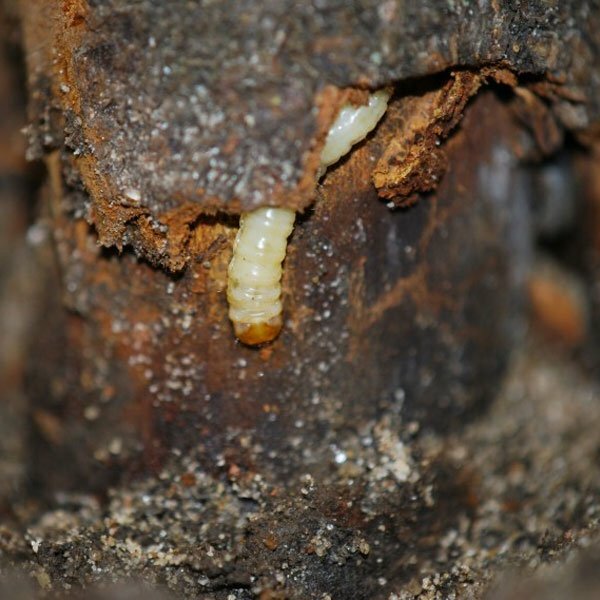 Spinosad, an OMRI listed pesticide, can also be sprayed on tree trunks as larvae hatch and directly into borer holes. Spraying can be repeated every five or six days up to two weeks before harvest. A recent study has shown that beneficial nematodes work against this destructive scourge. Nematodes attack eggs, larvae and pupae of numerous insect pests in soil. A spring application of nematodes suppressed 88% of orchard borer infestations. Spring and fall applications were found to be 100% effective. Parasitic wasps can help with lesser peach tree borer whose eggs can be found. They are not effective on the pupae of the common, greater peachtree borer because they’re under the soil line out of the wasp’s reach. But certain wasps will parasitize eggs found on bark and just-hatched larvae that have not yet worked their way into the tree. Woodpeckers and other birds will reduce numbers by grabbing larvae on and under the bark. Encourage them by providing suitable habitat and not spraying harmful pesticides. Cedar chips and bark spread around the base of stone fruit trees is said to repel egg-laying adult moths. In the south, spreading tobacco dust around the base of trees is a traditional method of discouraging pests. Some do-it-yourself sources advise the use of moth crystals to “gas” the larvae inside their burrows. It’s suggested that crystals worked into the soil at the trees crown will emit vapor that penetrates into the tree. 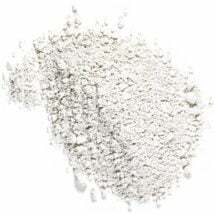 Moth crystals, like moth balls, are made from napthalene, a suspected carcinogen which is also linked to liver failure and neurological damage in infants. Using and handling naphthalene — not a natural-gardening practice — should be avoided.